Joe Breker, on his farm, giving an educational tour to area ag students. Joe Breker is not afraid of change. As a young farmer, after a stint as a student at NDSU, he challenged tradition and indeed his own father’s farming methods. Clarence Breker, who had the same intrepid spirit, went along with Joe on a journey to totally change over the Breker farm to no-till farming…at a time when almost nobody was doing it. They literally had to drive several hours to find another no-till farmer for a no-till confab. That was just the beginning. The Joe Breker farm has been a catalyst for change in agricultural practices for 38 years. In that same time period, many farmers in the region and across the nation have come to understand the value of this new way of thinking…proving wrong the old stereotype that farmers won’t change their ways. 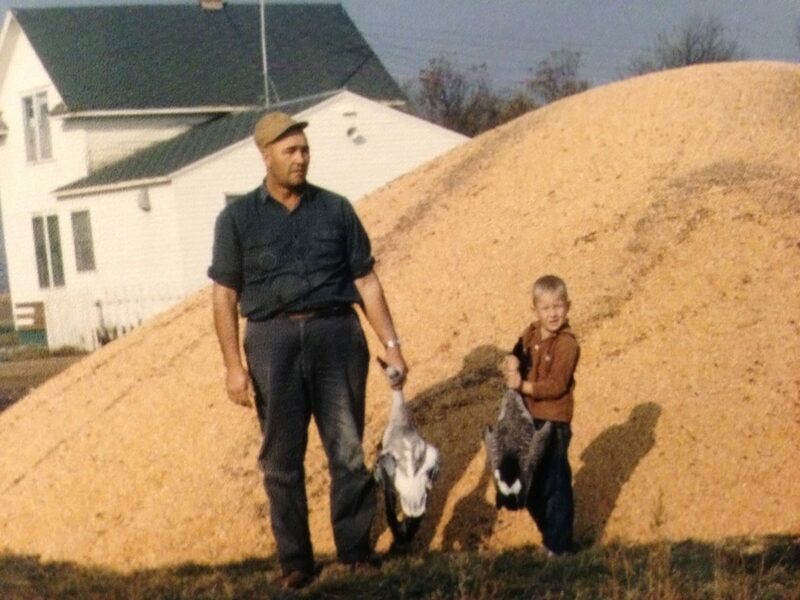 Clarence Breker and young Joe on the farm. Joe is a long time partner of the NDSU Extension Service to study and advance conservation farming methods in our region. To be effective, the Extension must partner with real world farms to test and compare methods on a large scale and the Extension needs open minded producers on the ground who are actively engaged in the exchange of ideas. 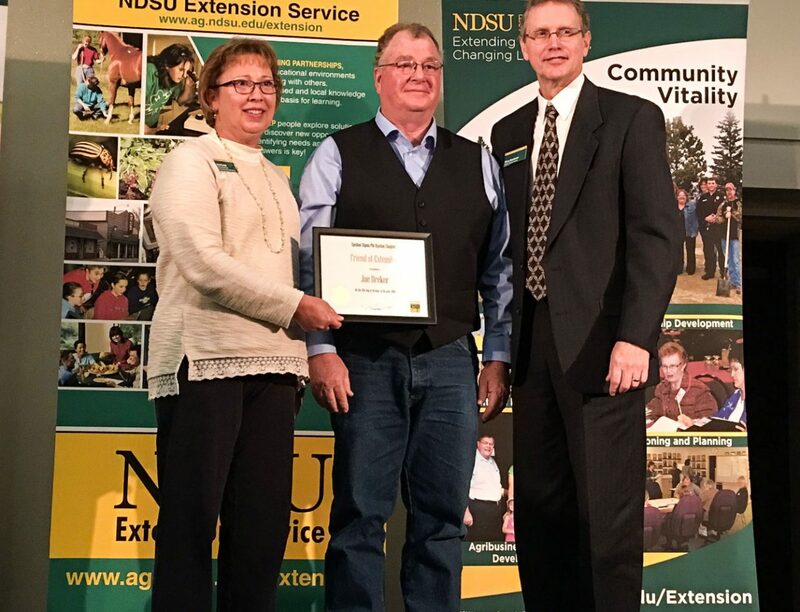 At a ceremony on October 19th, 2016, the NDSU Extension Service awarded Joe the ‘Friend of Extension’ Award for his contribution to the work of the Extension. Joe is a steward of the land in every sense of the term because he carefully and responsibly manages the 3,000 acres of land entrusted to his care. He was one of the first farmers in the region to change to no-till farming methods. However, he takes this idea of stewardship one step further: he shares his practices, equipment and equipment modifications with other farmers around the state. Joe also problem-solves with other farmers interested in adjusting practices so they can reduce tillage, include cover crops or manage residue. He participates in NDSU Extension soil health café talks, field days and workshops across the state, as well as large regional meetings on conservation tillage and cover crops, and national meetings and web-based resources. He has a huge influence on farming practices in the state, not by being aggressive, but by being accessible. Of course, Joe’s passion for farming and conservation are an integral part of the appeal and success of Coteau des Prairies Lodge. We offer tours, both formal and informal, of the Joe Breker farm and surrounding area. Joe loves to give our guests a unique experience on a farm — and not just any farm — a modern family farm that is on the cutting edge of agriculture research. Congratulations Joe, that is big honor!!! Congratulations, Joe….. and THANK YOU!